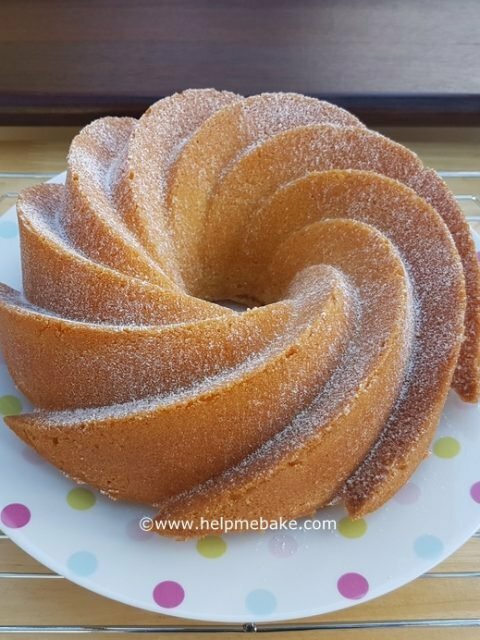 Recipe and Guide on How to make Lemon Bundt Cake using a Heritage Bundt Pan tin and the all in one method. Heritage Bundt Tin – Size 10 cups or 2.36 litres. Bake Easy or Greasing Spray for Tin. 1. Weigh out the sugar and margarine and add them to a large mixing bowl. 2. Take your medium eggs and crack them into a separate bowl, then lightly beat them together using a fork. 3. Once beaten pour the beaten eggs into your mixing bowl. 4. Weigh and sieve the plain flour and baking powder into the bowl. 5. Now add your tablespoons of milk. 6. Using a grater, grate your lemon skin to add the zest (ensure your do not grate down to the pith as it is bitter, the pith is the white tissue that lines citrus fruit). 7. Once you have all the zest cut the lemon in half and add juice from one half of the lemon. 8. Take a spatula and fold in the wet and dry mix together for about 10-20 seconds. 9. Now take your electric whisk and whisk the mixture together on a medium to high speed for approx a minute or until the batter has all combined. 10. Once combined set to one side. 11. Take your Heritage tin and spray with Bake Easy or an alternative cake greasing spray ensure you get in all the lines and ridges in the tin. Due to the shape of the tin you will be unable to line it, however, for additional release you may dust the tin with a light coating of flour as well as the greasing spray if you require. I did not dust using flour and the cake slid out fine just using the Bake Easy spray. 12. Pour the batter into the greased Heritage tin, using this recipe it should fill the tin about two thirds full which is the amount you should fill your Bundt tin. 13. Place on the middle shelf of the pre-heated oven and bake for 50 mins or until skewer comes out clean. 14. Once baked remove from the oven and then place your Bundt cake tin onto a wire rack. 15. Leave for about ten minutes and then turn your Bundt cake out onto a wire rack and allow to cool fully.